BOSTON - The Boston University men's ice hockey team closed out the non-conference portion of its schedule with a 5-2 loss to No. 18/15 Harvard in the Beanpot consolation game on Monday evening at TD Garden. Juniors Patrick Curry and Gabriel Chabot each scored for the Terriers, who now stand at 10-14-3 on the year. Frederic Gregoire tallied two goals, including the game-winner, for the Crimson to help them improve to 13-7-3. - After a scoreless first period, Harvard struck twice in the middle stanza to take a 2-0 lead. - Gregoire opened the scoring at 9:28 of the second on a shot from the right circle that beat BU netminder Vinnie Purpura short side. - Less than seven minutes later, Reilly Walsh picked up his second assist of the night when his cross-slot pass found an open Jack Badini above the left post for a 2-0 advantage. - Curry got BU on the board at 6:11 of the third when he got open at the top of the crease and sent home a centering pass from freshman Joel Farabee. - Gregoire reestablished a two-goal cushion for the Crimson with the teams skating 4-on-4 as his writer from the right circle eluded Purpura with 7:32 left in regulation. - With Purpura pulled in favor of an extra attacker, Adam Fox tallied a power-play goal with 3:09 to play to make it 4-1 before Chabot followed up his own rebound and scored his first goal of the season with 1:53 left. - Another empty-netter, this one from R.J. Murphy, sealed the victory for the Crimson with 42.9 ticks remaining. - The Terriers kept the nation's top power play scoreless on three opportunities. - Purpura recorded 34 saves for the Terriers while Michel Lackey turned in a 24-save performance for the Crimson. - Four Terriers (Curry, Farabee, Shane Bowers, Bobo Carpenter) now share the team lead in goals with 10 apiece. - Farabee, sophomore David Farrance and freshmen Mark Cheremeta and Jack DeBoer had one assist each. - Sophomore defensemen Cam Crotty and Kasper Kotkansalo each had a game-high three blocked shots. - BU starts a run of seven straight Hockey East games to close the regular season on Friday (Feb. 15) with a visit to UConn. - The game is the front end of a home-and-home weekend as BU will host the Huskies on Saturday (Feb. 16). 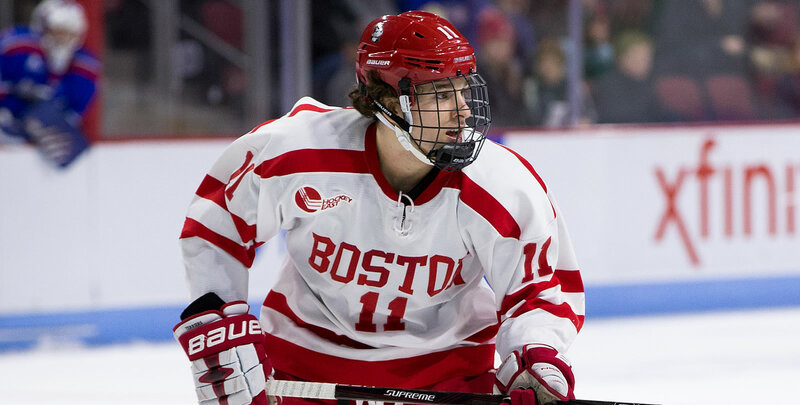 - BU kept the nation's top power-play unit scoreless on three opportunities. Both games will start at 7 p.m.